Knights don armor before heading into battle. You should probably put on some type of protection when you hop on your motorcycle. Knights did it and their rides only had 1 horsepower (rimshot)! 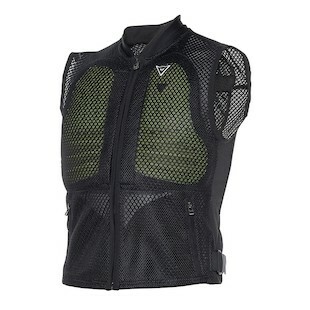 Dainese has got you covered with their Manis T Back Protector, Gilet Spine Protector, and Body Guard Vest. The Dainese Gilet Manis Back Protector combines the Manis T back protector with stretchy vest jersey material to provide CE-Level 2 protection for your back. This provides the same longitudinal stretching, bending, torsion, and lateral bending motion as the original Manis back protector without the lumbar strap. Put simply, this will provide hard shell back protection without feeling like you strapped on a turtle shell. This can be used for multiple applications from track days to reinforcing jackets that do not have impact armor options. The Dainese Body Guard Vest will protect your back with a CE-level 1 Wave G back protector along with CE-level 1 split chest plates in the front. During the hot months, urban riders will appreciate the airflow from mesh. As the temperatures drop, you can wear the vest underneath a protective jacket that's lacking armor. 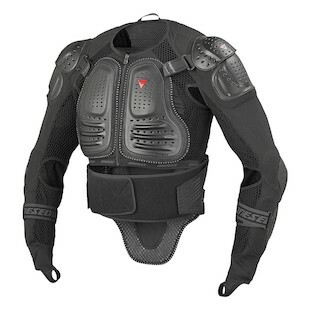 Or you can remove the chest and back armor from the vest and slide it into the pockets of a Dainese jacket. The choice is yours and yours alone. 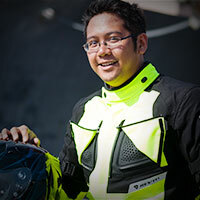 If you are looking for upgraded coverage, the Dainese Sport Guard Jacket is something worth your time to check out. With this option you will get the same level of high-end comfort and mobility, yet it will also be extended down the arms. By including forearm protection that is not afforded by the Manis Back Protector or Body Guard Vest, the defensive features of the Sport Guard offer slightly more utility in a variety of scenarios. 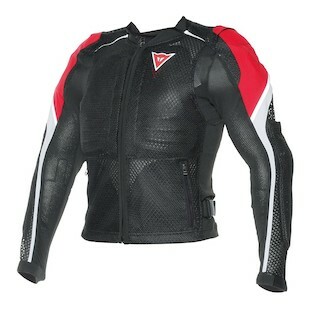 At the top of the chain, you would be looking at the Dainese Light Wave D1 Jacket. This option will be slightly beefier and offer a larger coverage area along the back. Stoutly defended from both the chest, back, shoulders, and forearms, the Wave D1 jacket is for the riders out there who are not messing around! This jacket provides an increased level of adjustability than its contemporaries. Dainese's Manis back protector, Body Guard Vest, and Sport Guard Jacket give you all the options you need to protect your torso. They won't hold up well in a joust, but they will be great when riding the motorcycle on the track or the street.